This article is about cities within Israel. For settlements established by Israel in the Israeli-occupied territories, see List of Israeli settlements. Israel has 15 cities with populations over 100,000, including Jerusalem at over 500,000 (including occupied East Jerusalem), and Tel Aviv. In all, there are 77 Israeli localities granted "municipalities" (or "city") status by the Ministry of the Interior. Two more cities are planned: Kasif, a planned city to be built in the Negev, and Harish, originally a small town currently being built into a large city. 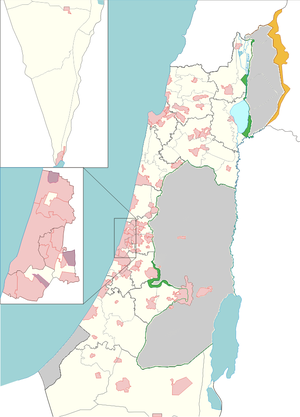 The area and population of Jerusalem includes that of East Jerusalem which has been de facto annexed by Israel and incorporated within Jerusalem's municipal borders under the Jerusalem Law. This, however, is not recognized by the international community who regard East Jerusalem as part of the Occupied Palestinian Territory. ^ Tel Be'er Sheva, remains of the ancient town, lies east of the modern city. ^ "Israeli Democracy: How Does It Work?". Israel Ministry of Foreign Affairs. Archived from the original on 22 June 2013. Retrieved 8 May 2013. ^ "Inventory of World Cities". Globalization and World Cities Study Group & Network. Archived from the original on 14 October 2013. Retrieved 11 April 2008. ^ Symon, Fiona (4 December 2001). "Jerusalem: Crucible of the conflict". BBC News Online. Retrieved 11 October 2012. ^ "Background on East Jerusalem". B'Tselem. 8 July 2012. Retrieved 11 October 2012. ^ "Profiles by Locality". Israel Central Bureau of Statistics. 2008. Archived from the original on 4 March 2016. Retrieved 2 May 2015. ^ "2004 local government profile" (in Hebrew). Israel Central Bureau of Statistics. Archived from the original on 4 February 2012. Retrieved 17 August 2007. ^ Population and Density per Sq. Km. in Localities Numbering 5,000 Residents and More on 31.12.2016 (Report). Israel Central Bureau of Statistics. 6 September 2017. Retrieved 12 January 2018. ^ SOCIO-ECONOMIC INDEX 2013 OF LOCAL AUTHORITIES, IN ALPHABETICAL ORDER OF HEBREW NAMES (PDF) (Report). Israel Central Bureau of Statistics. Archived from the original (PDF) on 13 January 2018. Retrieved 12 January 2018. This page was last edited on 29 January 2019, at 07:43 (UTC).